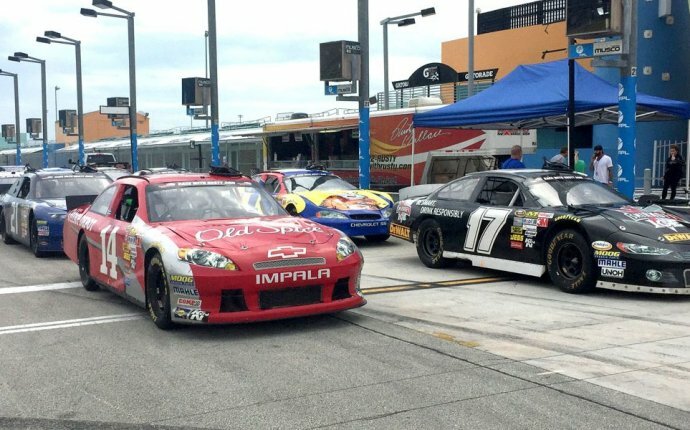 Visitors can choose different motorsport experiences at the Daytona Speedway from touring the track to actually driving a race car. We signed up for a quick tour of the track giving us a behind the scenes sneak peak of the world famous raceway. Our 30 minute experience took us along pit row and into victory lane where we lined up to have our picture taken. We stood on the podium where champions like Dale Earnhardt Sr and Jr, Mario Andretti, and Richard Petty won their cups. You can sign up for a 30 minute tour or take the expanded 90 minute VIP tour. Tours are quite reasonable starting at only $16 and the VIP only $50. Racing fans will love it. For more information on the speedway tours, and Richard Petty driving experience check out the Daytona 500 website. 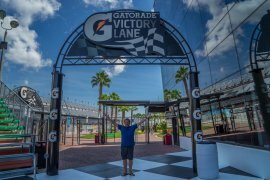 It was while sitting on a trolly with approximately 100 other people in the Florida heat that I started to think about all the other amazing motorsport experiences Dave and I have had around the world and it gave me an idea to round them up in a post. The Mongol Rally kicked off at Goodwood Stadium; a legendary Formula 1 racetrack famous for its annual Festival of Speed. Located 2 hours outside of London, England, it attracts the likes of Ferrari, Jaguar, Maserati, Mercedes and Porsche who race around the track at break-neck speeds. We had a bit of a different motorsport experience as we drove our tiny Nissan Almera packed with four adults and a ton of gear. This driving experience moved at approximately 10 km per hour! Known as The Festival of Slow it is the polar opposite of the Festival of Speed, but even though it was a slow ride, it wasn't a dull ride. To actually be able to drive on this celebrated track was a thrill of a lifetime and we relished every slow mile of it. What an amazing way to kick off our 6 week drive across two continents and 15 countries! Emilia Romagna, Italy is known as the land of motorsports. The car companies Ducati, Ferrari and Lamborghini originated here. While we saw a lot of Ferraris and Ducatis during our travels in Italy, we only met one Lamborghini in person. 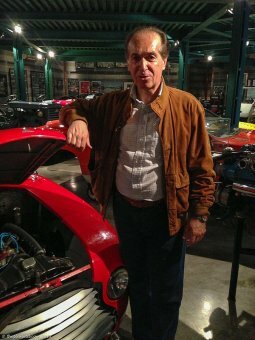 Fabio Lamborghini is the nephew of Ferruccio Lamborghini, and he runs the family museum located in the town of Doso. We had the privilege of taking part in a private tour of the museum with Fabio and let me tell you, he is Fabulous! It was so much fun listening to his private stories about his famous uncle. The coolest thing was to see the toy cars that he got to play with. We had tonka trucks, he had functioning mini Lamborghinis to drive around on. 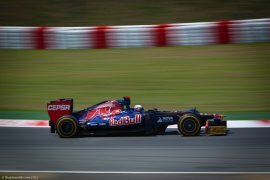 Our very first real life motorsport experience just so happened to be a VIP experience at the Circuit de Catalunya. The Spanish Grand Prix takes part just outside Barcelona at this famous track and we got to watch it in style. We flashed our VIP badges upon entrance and had free reign of the back hallways as we joined the ranks of the ridiculously rich and famous for a day. Our all-access pass let us into the VIP area where we could sip champagne, enjoy fine food and explore every inch of the backstage. We witnessed the racing team's staging areas and ultra luxurious motorhomes and then watched the race from the VIP owner's boxes. It was truly out of this world.